Our collections celebrate and often reflect people’s excellence, endeavour and achievement and being in the throws of Olympic achievements we’ve looked at the Dunfermline College of Physical Education archives to see what we could find. The Old Students Association for the College, which is still going strong, can boast of members that competed at the Olympics and many who became so expert in their sport, that they were asked to coach or umpire. We thought however we’d try and find an example of being a spectator at the Olympics, as many of us are doing that, watching it on television at home. While this is not the same as attending, many of you may have actually attended events at the Olympics in London in 2012 or the Commonwealth Games in Glasgow in 2014. Maybe you’ll recognise the experience C.D. 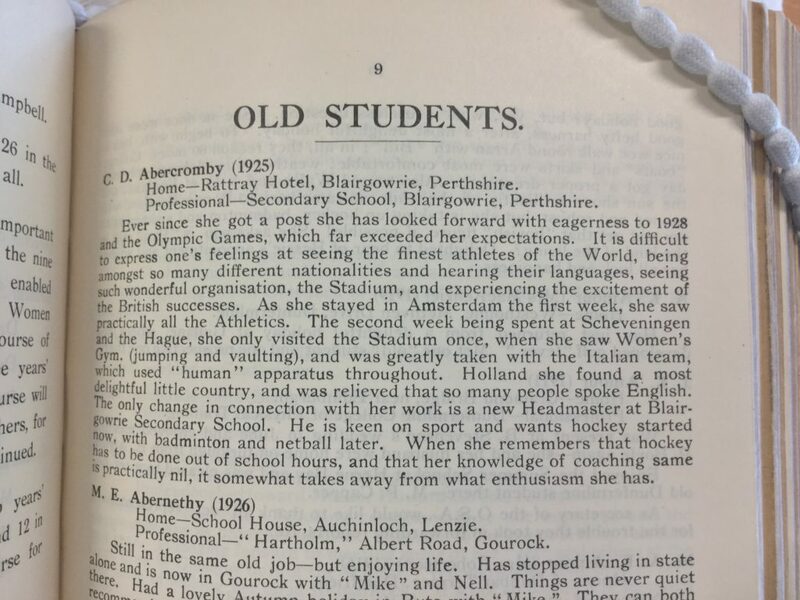 Abercromby had in 1928, when attending the Olympics in Amsterdam, Holland.